Tapirira obtusa (Benth.) J.D. Mitch. Mandevilla funiformis (Vell.) K. Schum. Oxypetalum lanatum Decne. ex E. Fourn. Hydrocotyle leucocephala Cham. & Schltdl. Hydrocotyle quinqueloba Ruiz & Pav. var. asterias (Cham. & Schltdl.) Urb. Hydrocotyle quinqueloba Ruiz & Pav. var. quinqueradiata Urb. Aristolochia melastoma Manso ex Duch. Ageratum fastigiatum (Gardner) R.M. King & H. Rob. Austrocritonia velutina (Gardner) R.M. King & H. Rob. Baccharis rufidula ( Spreng. ) Joch.Müll. Chromolaena multiflosculosa (DC.) R.M. King & H. Rob. Anemopaegma floridum Mart. ex DC. Callichlamys latifolia (Rich.) K. Schum. Racinaea aeris-incola (Mez) M.A. Spencer & L.B. Sm. Ananas bracteatus (Lindl.) Schult. & Schult. f.
Billbergia elegans Mart. ex Schult. Vriesea heterostachys (Baker) L.B. Sm. Vriesea penduliflora L. B. Sm. Vriesea procera (Mart. ex Schult.f.) Wittm. var. tenuis L. B. Sm. Rhipsalis elliptica G. Lindb. ex K. Schum. Lobelia hilaireana (Kanitz ) E.Wimm. Canna paniculata Ruiz & Pav. Eleocharis maculosa (Vahl) Roem. & Schult. Dioscorea piperifolia Humb. & Bonpl. ex Willd. Sloanea hirsuta Planch. ex Benth. Sloanea stipitata Spruce ex Benth. Agarista hispidula (DC.) Hook. f. ex Nied. Agarista revoluta (Spreng.) Hook. f. ex Nied. Gaylussacia cf. retusa Mart. ex Meisn. Gaylussacia rhododendron Cham. & Schltdl. Comanthera linearis (Ruhland) L.R.Parra & Giul. Comanthera nivea (Bong.) L.R.Parra & Giul. Acalypha amblyodonta (Müll. Arg.) Müll. Arg. Alchornea triplinervia (Spreng.) Müll. Arg. Chamaecrista cf. nictitans (L.) Moench. Cleobulia multiflora Mart. ex Benth. Bionia bella Mart. ex Benth. Cheiloclinium serratum (Cambess.) A. C. Sm. Peritassa flaviflora A. C. Sm. Vismia magnoliifolia Cham. & Schltdl. Vismia parviflora Cham. & Schltd. Crocosmia crocosmiiflora (Lemoine ex Morren) N.E.Br. Trimezia juncifolia (Klatt) Benth. & Hook. Eriope macrostachya Mart. ex Benth. Hyptis monticola Mart. ex Benth. Beilschmiedia taubertiana (Schwacke & Mez) Kosterm. Persea rufotomentosa Nees & Mart. Cuphea ingrata Cham. & Schltdl. Luehea candicans Mart. & Zucc. Tibouchina semidecandra (Schrank & Mart. ex DC.) Cogn. Ficus cf. adhatodifolia Schott ex Spreng. Ficus enormis Mart. ex Miq. Virola bicuhyba (Schott ex Spreng.) Warb. Psidium rufum Mart. ex DC. Ouratea semiserrata (Mart. & Nees) Engl. Bifrenaria harrisoniae (Hook.) Rchb. f.
Bulbophyllum luederwaldtii Hoehne & Schltr. Campylocentrum linearifolium Schltr. ex Mansf. Catasetum cernuum (Lindl.) Rchb. f.
Cirrhaea cf. dependens (Lodd.) Loudon. Cleistes gracilis (Barb. Rodr.) Schltr. Cleistes moritzii (Rchb. f.) Garay & Dunst. Cranichis candida (Barb. Rodr.) Cogn. 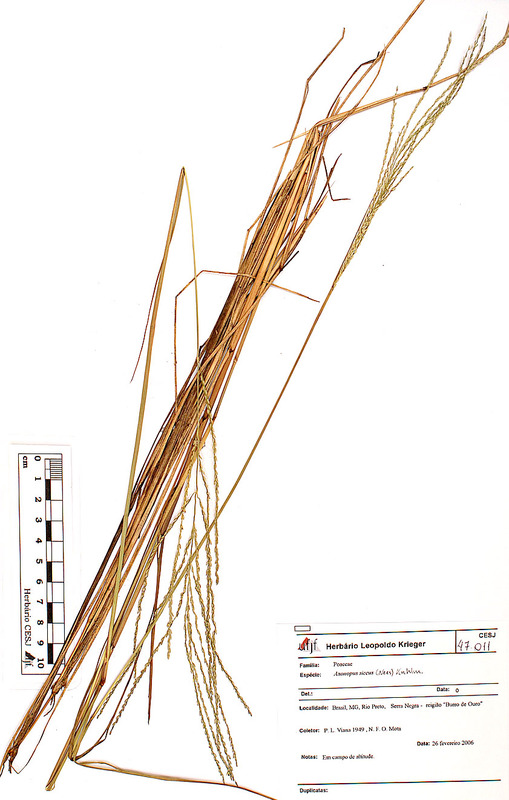 Cyclopogon warmingii (Rchb. f. & Warm.) Schltr. Eurystyles actinosophila (Barb. Rodr.) Schltr. Isochilus linearis (Jacq.) R. Br. Maxillaria acicularis Herb. ex Lindl. Maxillaria ochroleuca Lodd. ex Lindl. Sarcoglottis umbrosa (Barb. Rodr.) Schltr. Pleurothallis grobyi Bateman ex Lindl. Pleurothallis modestissima Rchb. f. ex Warm. Pleurothallis tricarinata Poepp. & Endl. Pogoniopsis cf. nidus-avis Rchb. f.
Stelis intermedia Poepp. & Endl. Warrea warreana (Lodd. ex Lindl.) C. Schweinf. Passiflora cf. haematostigma Mart. ex Mast. Pera glabrata (Schott) Poepp. ex Baill. Peperomia alata Ruiz & Pav. Peperomia tetraphylla (G.Forst.) Hook. & Arn. Peperomia trinervis Ruiz & Pav. Peperomia urocarpa Fisch. & C.A.Mey. Piper arboreum var. hirtellum Yunck. Axonopus fastigiatus (Nees ex Trin.) Kuhlm. Eragrostis rufescens Schrad. ex Schult. Ichnanthus pallens (Sw.) Munro ex Benth. Panicum cyanescens Nees ex Trin. Zizaniopsis microstachya (Nees ex Trin.) Döll & Asch. Polygala lancifolia A.St.-Hil. & Moq. Polygala laureola A.St.-Hil. & Moq. Heteranthera reniformis Ruiz & Pav. Rubus sellowii Cham. & Schltdl. Amaioua intermedia Mart. ex Schult. & Schult.f. Bathysa cuspidata (A.St.-Hil.) Hook.f. ex K.Schum. Borreria capitata (Ruiz & Pav.) DC. Coccocypselum erythrocephalum Cham. & Schltdl. Coccocypselum lanceolatum (Ruiz & Pav.) Pers. Diodia saponariifolia (Cham. & Schltdl.) K.Schum. Galium cf. hypocarpium (L.) Endl. ex Griseb. Guettarda uruguensis Cham. & Schltdl. Manettia gracilis Cham. & Schltdl. Palicourea tetraphylla Cham. & Schltdl. Psychotria leiocarpa Cham. & Schltdl. Psychotria ruelliifolia (Cham. & Schltdl.) Müll.Arg. Athenaea pereirae Barboza & Hunz. Brugmansia suaveolens (Willd.) Bercht. & J.Presl. Solanum incarceratum Ruiz & Pav. Solanum swartzianum Roem. & Schult. Symplocos cf. pubescens Klotzsch ex Benth. Barbacenia flava Mart ex Schult. 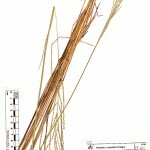 f.
Você está em: Herbário Virtual > Angiospermas > Poaceae > Axonopus siccus (Nees) Kuhlm.